Experts from the U.N. and the chemical weapons watchdog are blaming the Syrian government for an attack in April using the nerve gas sarin that killed over 90 people. Children who survived a deadly suspected gas attack in Syria's northern Idlib province were hooked up to ventilators as they recovered on Tuesday, April 4, 2017. A top Syrian military official denied government responsibility for the attack, which was carried out around the same time as other airstrikes in the area. U.S. Ambassador Nikki Haley heads the U.N. in April, as the rotating position of president falls to the United States. The April 5 meeting comes after what strongly appears to be a deadly chemical weapons attack in Syria. 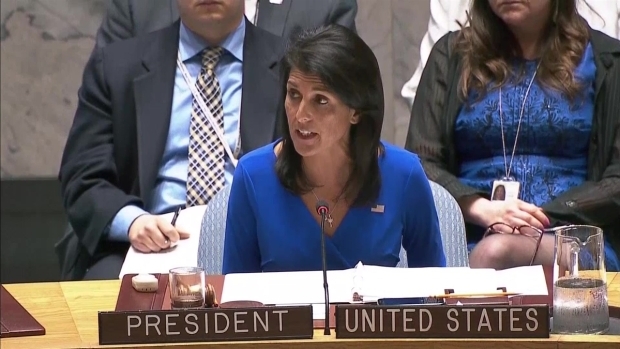 While staunch ally Russia defended the regime of Bashar Assad, Haley directed stinging criticism at Russia. “If Russia had been fulfilling its responsibly, there would not even be any chemical weapons left for the Syrian regime to use," she said.